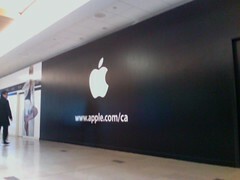 Vancouver is finally getting an Apple store. About time. Although I would note I always got good intelligent, friendly service at MacStation. In fact the "make an appointment" attitude at a Mac store is damn annoying, but still going there is the only chance you have to have some problems addressed. Pic and article thanks to TechVibes. Now all Canada needs is the iPhone in time for me to arrive back there. Another interesting point was on the question: will Canada ever get a Silicon Valley? Every country wants one, be it the UK or Canada. The answer is no and here was an interesting take on Startup North. Most people love there city and don't want to move. With notable exceptions in the US (say Austin, New York, Boston, Portland, SF) most American cities are extremely homogenous *. The population is extremely mobile, large numbers of people move to find jobs and a large number moved to that area. In Canada people tend to move a lot less, they like where they are. For example, if you spend a long time on say the west coast you will either a) love it and stay or b) not be there very long. That causes small numbers of concentrations in Vancouver, Montreal, Ottawa, Waterloo area. Lots of Canadians like where we live, that inertia prevents another Silicon Valley. And let's face it if you've been there, you might think that's a good thing. * I know I'm asking for a flood of email proving the opposite. Hey it's an opinion based on my travels and visiting lots of cities with the exact same malls and shops every 3 blocks.